In the video game industry most sports have annual releases, some even bi-annual, but for tennis fans you just never know. It was almost three years ago we saw 2K’s last entry in their coveted tennis franchise (Top Spin 3) and the marketplace hasn’t changed much in that time frame. So in the past few years has 2K and new developers 2K Czech have finally brought us the next entry to the series in Top Spin 4. The question on most tennis fans is has it been worth the wait? Read our full review to find out. I try to make sure when I am writing a review that I grant the reader perspective of my experience right out of the gate. I have been a long time tennis fan, and am one of the minorities that follows the sport even outside of the four major tournaments. Not only do I enjoy the professional sport I have dabbled in playing the sport for the majority of my life, so I have a big interest in a tennis video game. So going into Top Spin 4 I am one of the many that have been anxiously awaiting a new tennis game and had high expectations going into the review of this game. So let’s cut the chase now and get into the review. First up is the new mechanics which are kind of a cross between Top Spin 2 & 3. You have the ability to play the entire game using nothing but the face buttons which still allow you to hit the ball flat, with top spin, slice, and lob. Timing has become the key to any shot, as if you hit the ball too early or too late and your shot is more then likely not going to go where you want it. Also given the duration of which you hold the button will determine the amount of power put into a shot. Serving can also be done using the right analog stick which works but pulling back to toss the ball in the air and pushing forward to swing. The controls are spot on giving but advanced gamers as well as new fans a chance to hit the ball around. Along with smooth controls you can see that 2K Czech has spent a good deal of time tightening up the games animations. Each of the pro’s in the game have a distinct playing style both in real life and in the video game. 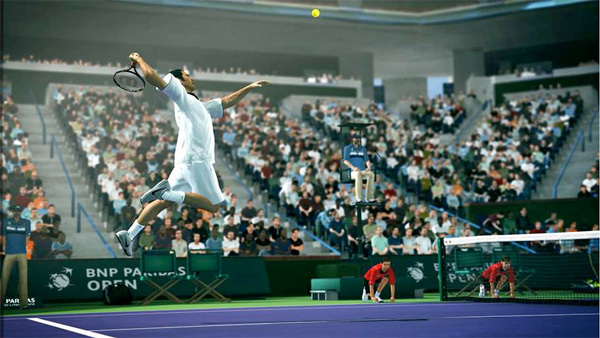 So if you’re playing as Andy Roddick you will notice his very prominent serve, or Federer’s beautiful one hand backhand. Not only do the developer’s nail the playing styles they do a great job of allowing the points to flow. A lot of times in Top Spin 3 points felt pretty mechanic, but in Top Spin 4 seems to flow much better. Transitioning from the backcourt to the net is as easy as hitting the right bumper and making your way forward. If your opponent gives up a decent lob you now have the ability to chase it down and get yourself back in the point. So with smooth Gameplay and good controls, the game lends itself ready for a great career mode. Sadly the career mode although deep and full of tennis action still is a few steps away from being great. You start off with a very in depth character creation process which allows you to do a ton of work on both your players personal characteristics and his/her playing style. Once you have your created character your off to start your career. First you go into the Minor Tournaments and work your way up to Majors, Masters, Grand Slams, and even tournaments for your country. Along the way you will be able to train your player playing practice matches as well as sponsor matches and dream matchups. The backend system for the career mode is relatively simple you want to gain XP which allows you to level up your player to the max level of 20. While leveling up your tennis player you then can focus the awarded XP on three major categories Serve and Volley, Offensive Play, and Defensive play. The system lends itself nicely to those inexperienced in the tennis genre but for those who have played these games before I would imagine more control will be wanted. To me the biggest problem with Top Spin 4’s career is the lack of variability. After a year or two in the game world you start to just skip month’s altogether and act like Tiger Woods used to be in golf and play a few tournaments and the Grand Slams and call it a year. I also found that you could always see a few months in advance that your player was ready to go to the next level as the current competition would become far too easy for the point in which your player was at. All in all I enjoyed the career but there was nothing about it that pushed the envelope. There are a few other minor annoyances with Top Spin 4. First there is a complete lack of commentary that tennis fans have been asking for, for years. In fact some of the only voice work in the game is at the start of the match where no matter if your playing as your created player or the licensed ones they constantly repeat “Here comes the players”. You would think at the very minimum they would be able to announce the licensed players to the court. They also label unforced errors “faults” which I have never heard of in tennis either. Of course there is still the online component, which holds up quite nicely. Along with the normal quick play options there is also the ability to play in tournaments and further progress your player online. The online play is smooth and doesn’t falter and manages to give the game plenty of replay value outside of the offline content. Visually Top Spin 4 is quite the spectacle. What stands out more then anything has already been mentioned but bears repeating and that is the animation. You can see that a ton of work has gone into making the many transitions of a tennis point to come as seamlessly as possible. Movements on court along with each player’s unique styles are portrayed to a somewhat spooky precision. The various tennis arenas (with the obvious lack of Wimbledon) that are included are presented beautifully with the amount of detail that if you have ever visited or attended these places makes you feel like your there. The only real visual problem I had with Top Spin 4 was the menus that looked dated. Top Spin 4 had a goal of being both accessible and deep. It’s a commonly failed goal, but one that 2K Czech was able to capture. The game at its most basic level can be as simple as a game of pong but then can be as complex as any sports game that’s on the market today. Having played a ton of Top Spin 4 in the last few weeks I can say that the game holds up especially with a pretty solid online community that has made for some truly epic matches. All in all Top Spin 4 has the depth, the approachability, and the finesse that you would want from a simulation tennis experience. What stands out about Top Spin 4 when it is all said and done is the amazing on court action. Whether your playing with a friend or the computer the game brings to life the game of tennis like no other game before it has. Hopefully now we don’t have to wait another 2-3 years for the next Top Spin game. Top Spin is by far the best tennis game of all time. The one thing that could use improvement for a hopeful sequel next year is a longer career mode. Besides that, Top Spin tennis is perfect. If you are in need of a tennis game or even a game to get use out of your Live subscription, Top Spin is a perfect game for just that. Although I enjoyed my time with Grand Slam Tennis 2 there is still plenty of room for improvement and my hope is that EA doesn’t give up on the young series and comes back with an ace in its follow-up. 2K Sports has done Top Spin 3 a great service with a lot of the improvements that the game has gotten. The only issue I really had was the control scheme which I think takes some of the excitement of the Top Spin experience away, but at the same time sets up a deeper experience for Top Spin in the future.